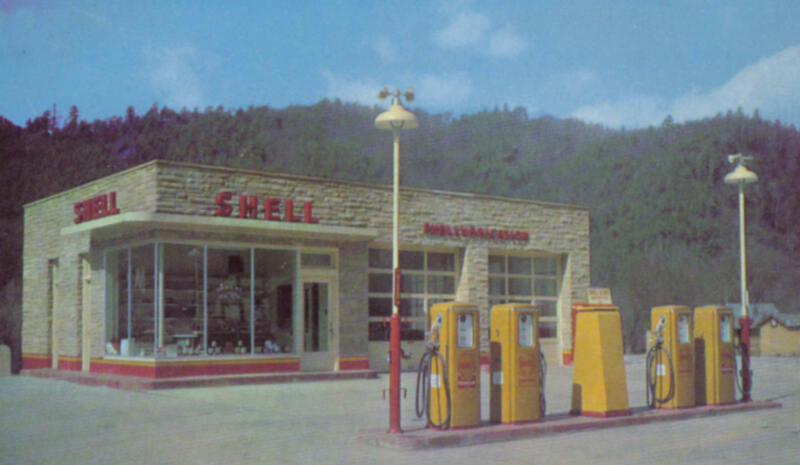 An old picture of the Shell Station Downtown on the right side of the road before you hit the mountains. Thanks to Bob Howard for providing this picture. The Gatlinburg Skylift. On The Left - an old black and white photo on the sky lift, date unknown, thanks to Vicky Hankins for providing this picture. 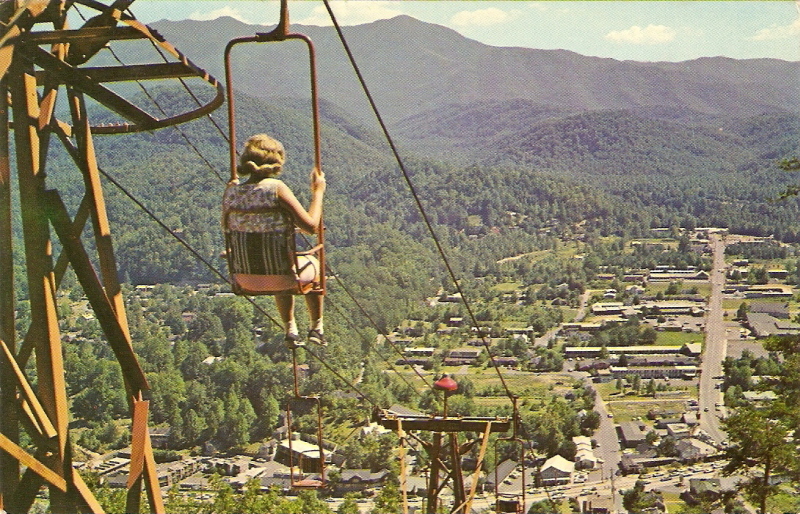 In the middle the Gatlinburg Sky Lift Circa 1950's, notice the single seats. 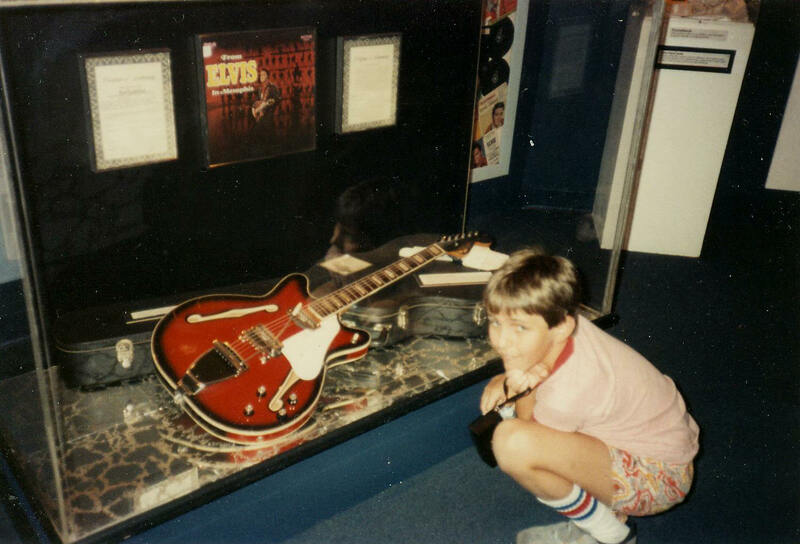 Thanks to Bob Howard for supplying this picture. 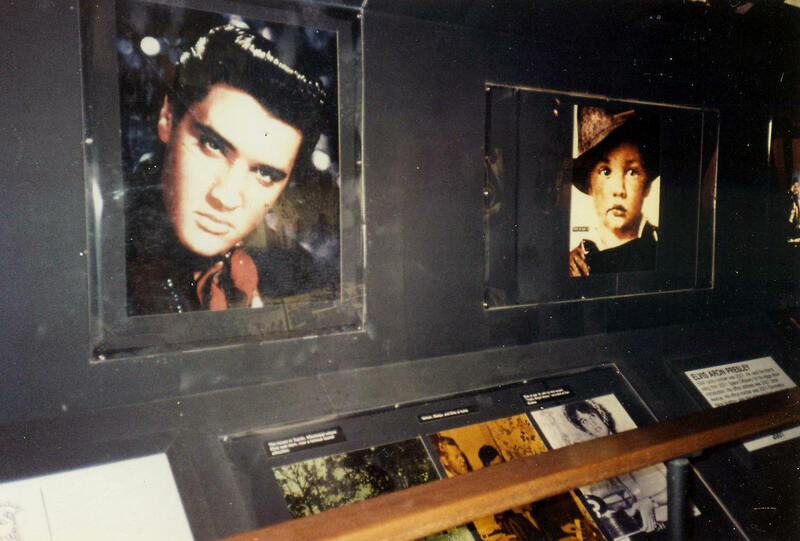 On the right is a Sky Lift Picture from 1963, Thanks to Vicky Hankins for providing this picture. 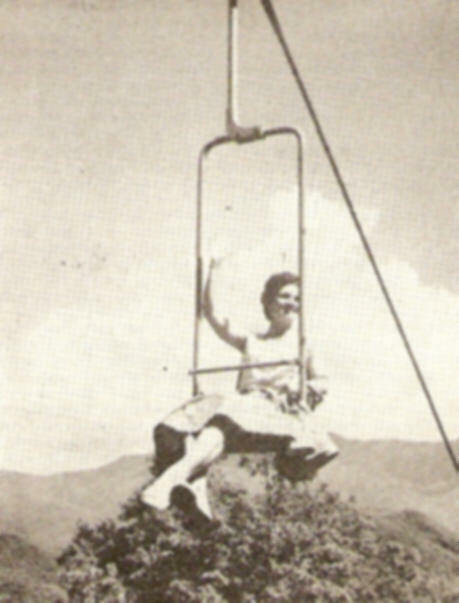 The 1968 Gatlinburg Directory Guide says this about Gatlinburg Sky Lift, Inc: First of its kind in Dixie, operates early spring through late Autumn carrying passengers up Crockett Mountain to the grandstand view of the Great Smokies - a promontory from which much of the National Park and its Tennessee host town of Gatlinburg is visisble. The round trip extends approximately one mile. The lift's upper terminus offers a superb view. 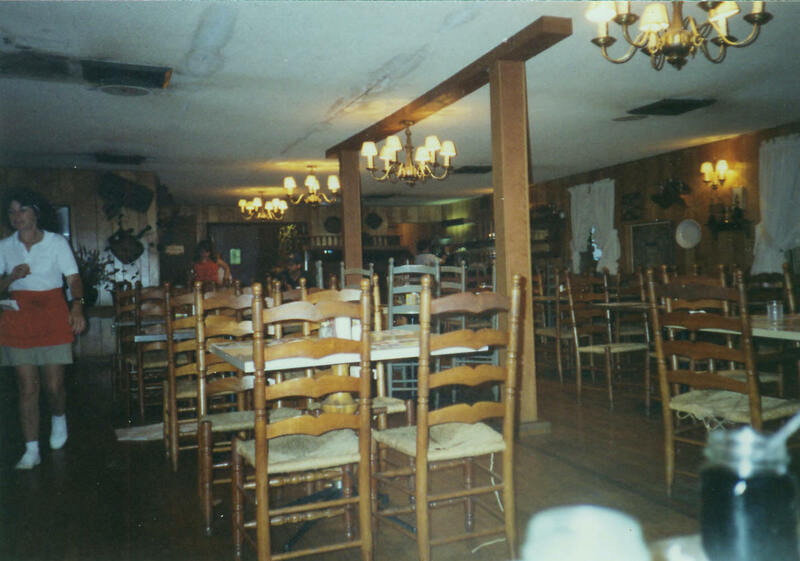 Inside The Treehouse Restaurant, located next to Ober Gatlinburg, the building became Maxwell's Seafood Restaurant, (See picture on right) and the tree was still in the roof. 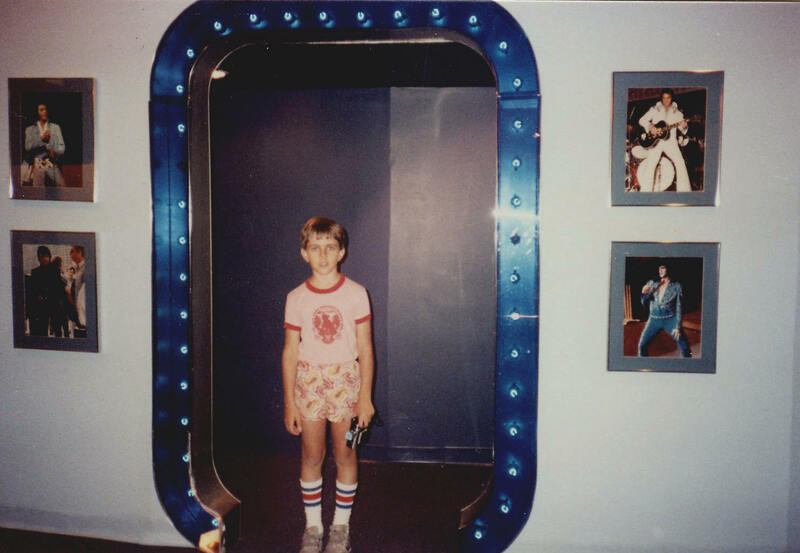 The building is now Crockett's Breakfast Camp as seen below. 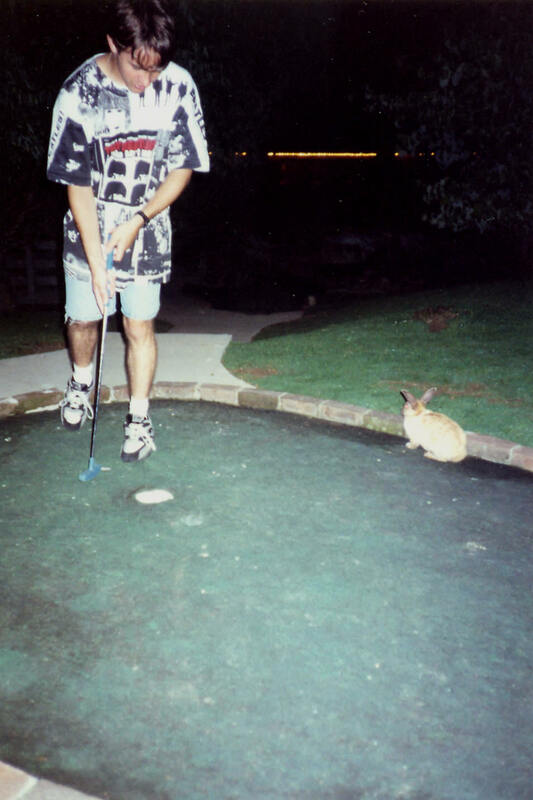 In the mid 90's Bunny Golf appeared near Ober Gatlinburg. 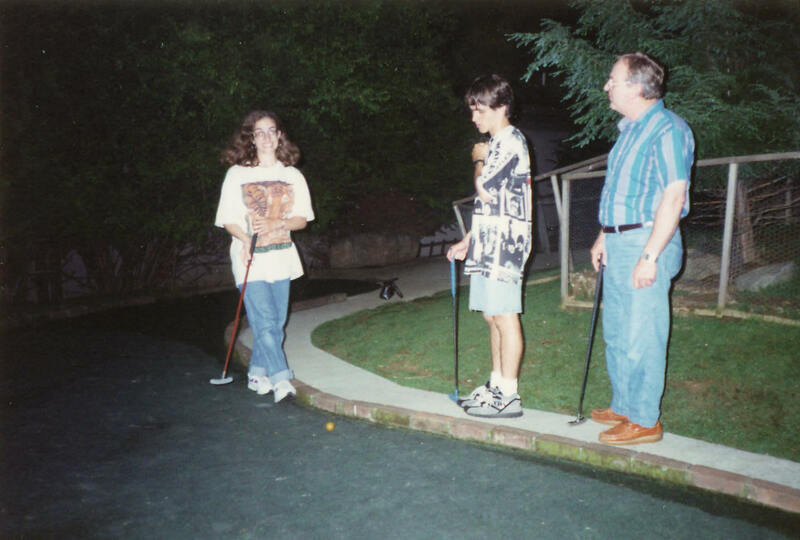 It was located where the parking lot near the wedding chapel now is. 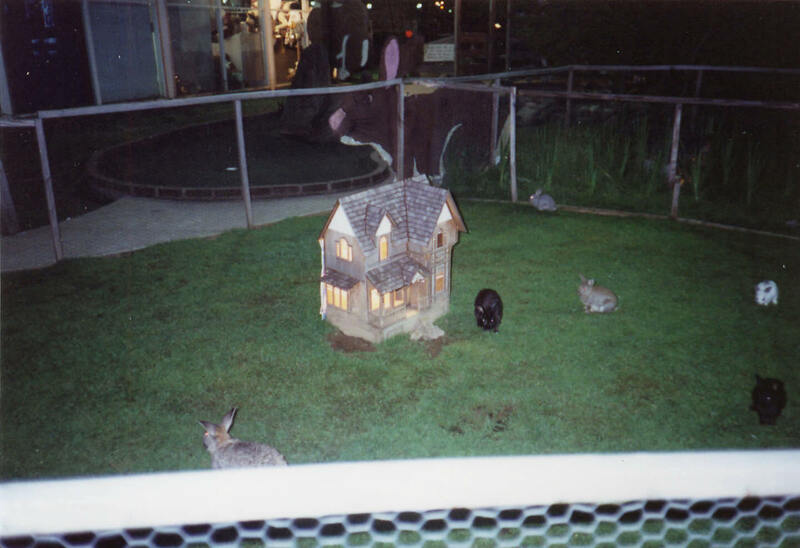 For a cheap price of around $3.00 you could play golf with bunnies running around in a caged Mini-Golf Course. Unfortunately another not so clear picture. 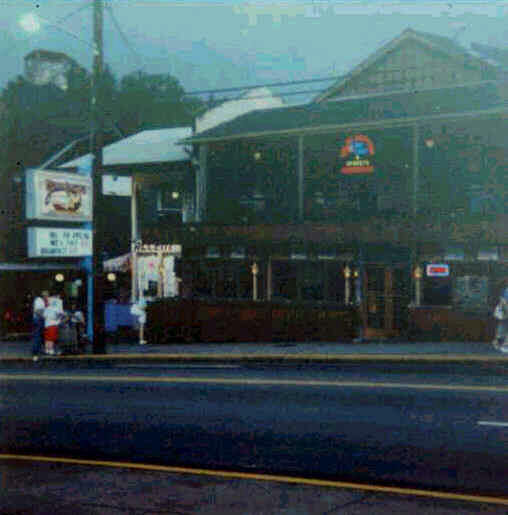 Waldo Pepper's where Crawdady's is now located (see picture on right). I believe before being Waldo Pepper's it was a place called the S & M Restaurant. The 1968 Gatlinburg Directory Guide says this about S & M Restaurant: 762 Parkway. Specializing in charcoal broiled steaks, chops, seafood, country ham and hot biscuits. Breakfast, sandwiches, short orders, dinners. New upstairs Sir Loin Room. Watch our Chef broil your steak to perfection in this new dining room. 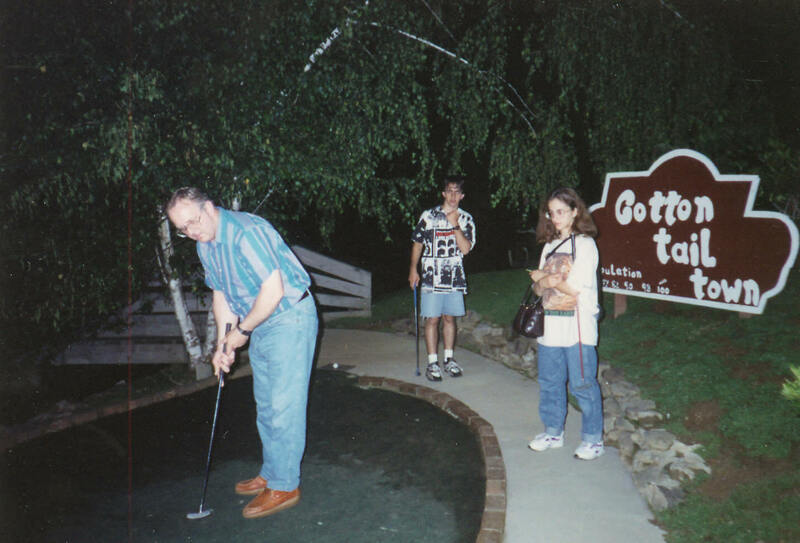 Open 6 a.m. to 11 p.m. year-round. Air-conditioned. Mr. and Mrs. Stuart Reagan. The photo on the left shows the old Sky Lift shelter building from a distance. 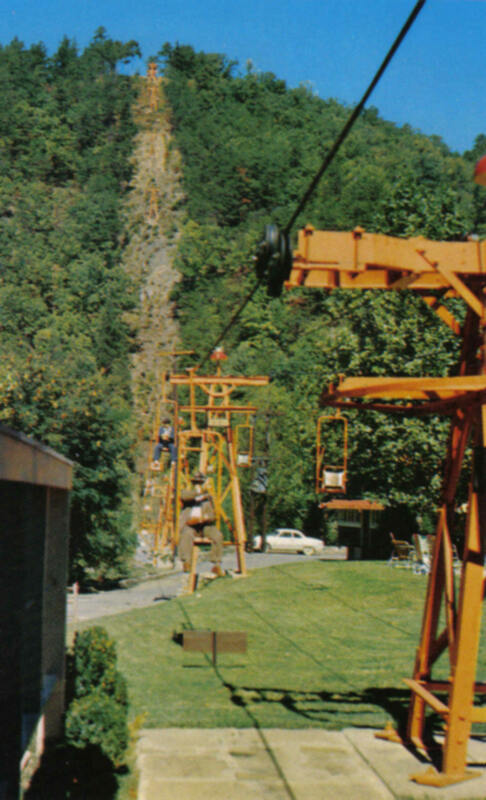 The video on the right is a ride up the Sky Lift when the shelter building was still there. The video on the left is from the top of the Sky Lift panning out over the city. The video on the right is riding down the Sky Lift. Notice on the way down that Midtown Lodge is still there. Crockett's Breakfast Camp outside and inside in the location formerly occupied by the Treehouse Restaurant and Maxwell's Seafood & Steak. 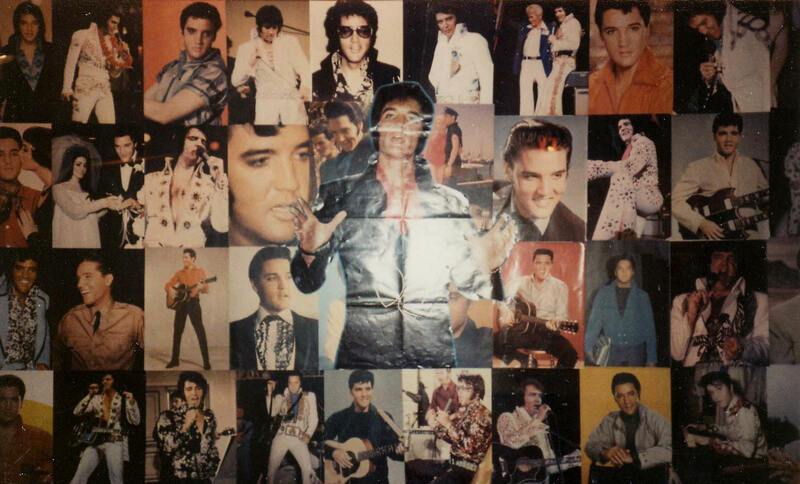 Riverbend Mall where the Elvis Hall of Fame Museum used to be. 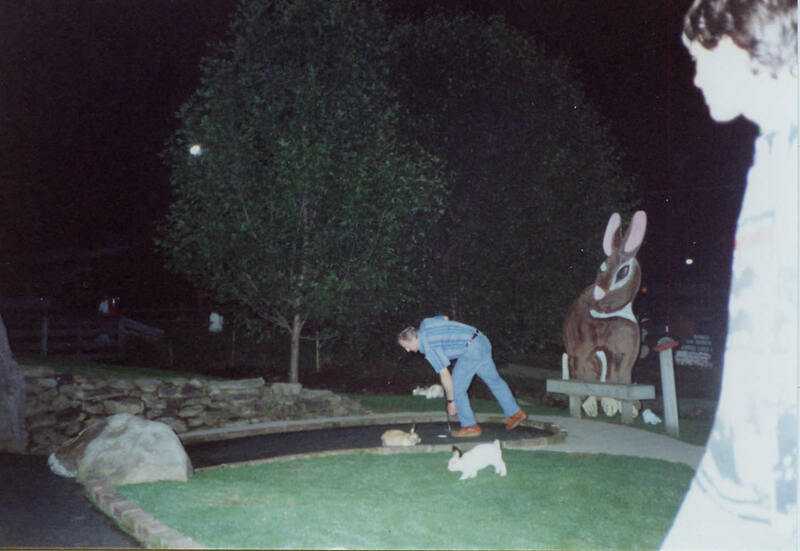 Below is a video of Riverbend Mall.